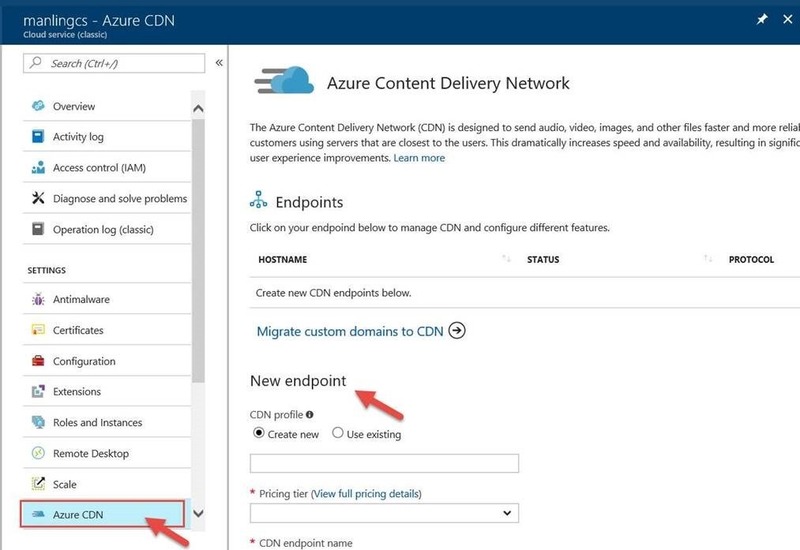 When using Azure to deliver your business scenarios, you can add the content delivery network (CDN) to your solution for better performance, scalability and security. Whether it's for mobile app delivery, digital marketing websites, videos or live streaming an event, we believe that CDN should be part of your solution architecture for better user experience, and have made it super easy for you to deploy. For this reason, we started integrating Azure CDN into other experiences in the Azure services portal. In May, we have announced the integration with Azure Storage and Azure Web App. To learn more, watch my demo on Azure Friday. Today we are excited to announce that we have extended the portal integration to Azure Cloud Services, a Platform-as-a-Service (PaaS) offering from Azure. With this integration, customers can easily enable CDN to scale a cloud service without leaving the cloud service extension. This is a great addition for customers who want highly available and scalable cloud application with more control. Also, using Azure Cloud Services gives you more control over VMs. To get started, go to the Azure portal Cloud Services extension and create a cloud service. From the service management page, select "Azure CDN". With few steps, you will have a running CDN! Simply return to this experience to manage all the CDN endpoints created for this cloud service. After enabling CDN, click the endpoint to manage configuration directly from this extension.